Barney Riley Trail is a great moderate trail to a fun destination. Most of the trail is easy but filled with small rocks that can rattle your fillings loose. 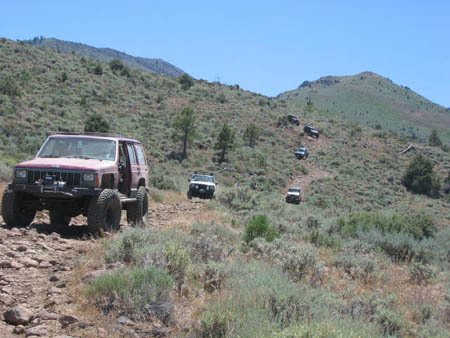 Lowering your tire pressure and taking your time will make this trail much more enjoyable. This trail is filled with some great views and a few steep climbs, nothing a suitable high clearance four wheel drive could not handle. There is a great picnic area at the end of the trail with shade, a great place to swim in the river and a natural hot spring to soak in. Trailhead - The trailhead is a short distance east of Hwy 4 on Hwy 89 and is not marked. When accessing the trail while heading east on Hwy 89 the trail starts up the hill to the north in the opposite direction causing you to make a u-turn from Hwy 89 to the trail. Left on 190C - There are many roads going through this area but most are well marked and should not be an issue even without GPS, although it sure helps. Slight Right - Continue slightly right on the main road. Take note of where you came from for the return trip. There are many roads in the area that could take you off in the wrong direction. Cross Roads - Going left or right at this point will both bring you to the next waypoint. 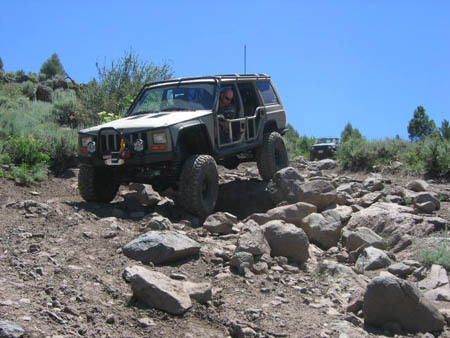 A right will take you through a valley and over a moderate climb with a few optional rock obstacles. We did not travel the route to the left but it appears more difficult. This this route will take you over the hill first and then through a valley to a big pond. The waypoint is just beyond the pond but depending on it's water level the road may be blocked. Barney Riley Road - This is the point where the two trails merge back together. This is also where the trial joins Barney Riley Road. Hot Springs - Look across the river and you will see the natural hot springs coming out of the rock wall. There is also an old man made rock tub to soak in. This is a great place to swim and enjoy lunch before taking the long road back home.